Thielemans’ first instrument was actually the accordion; he was a child entertainer in the Brussels sidewalk cafe run by his parents. As a teenager, he took up harmonica and guitar, but he still didn’t dream of music as a career. He had heard jazz, and it became his passion [...] However, the harmonica was and is still best-known as a blues or folk instrument—or a toy—and he faced an uphill battle for acceptance. 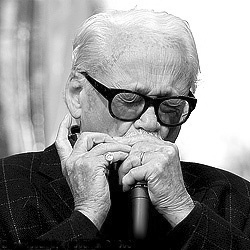 It was Mr. Thielemans’s inimitable technique and distinctive sound on the chromatic harmonica, an instrument that he single-handedly proved could hold its own in the jazz repertory, for which he will be remembered. Any musician who plays jazz on a “non-standard” instrument, whether it’s harmonica, violin, ukulele, or (of course) accordion, owes some debt of gratitude to Toots, who showed us that the most unlikely of instruments can still swing.